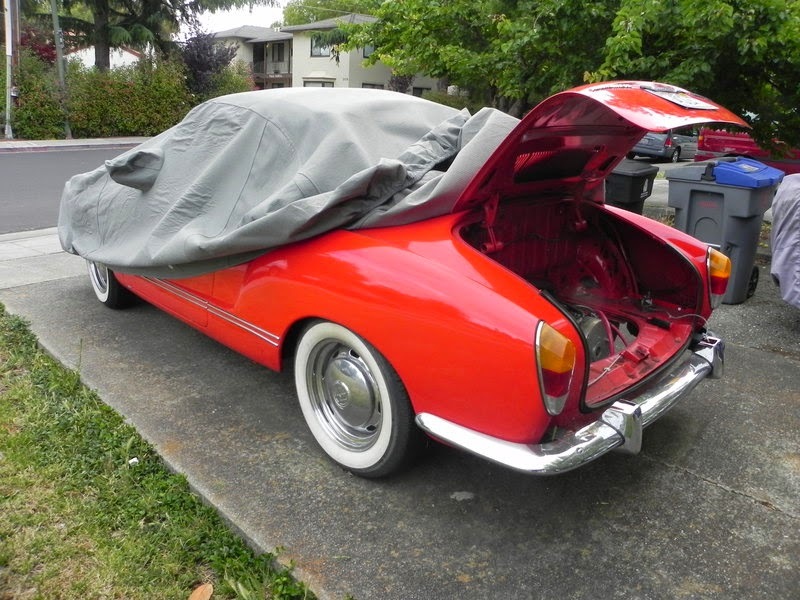 As said while describing the original conversion of this Karmann Ghia, the top speed of at most 50 miles/hr and driving range of at most 10 miles was not satisfactory. I wanted to upgrade it, and that meant replacing the entire EV conversion with a completely different drive train and battery pack. The new components are listed on the home page. 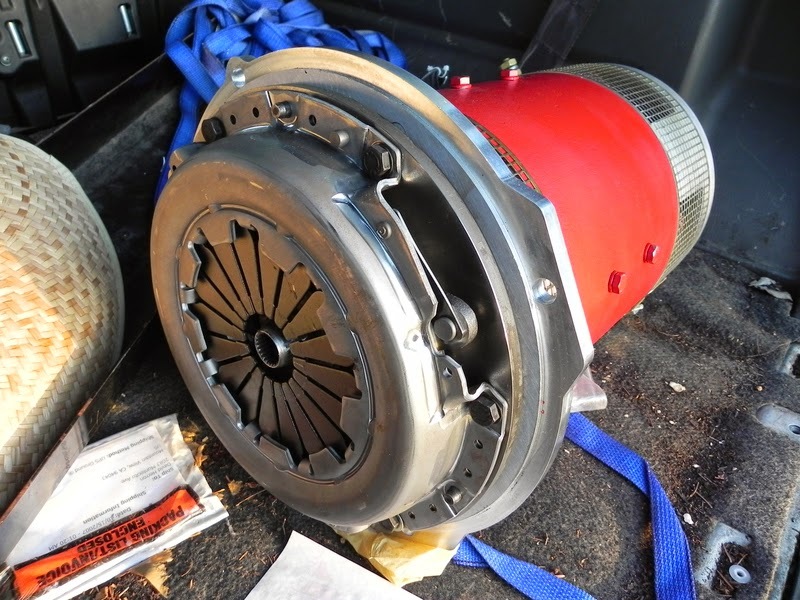 This is the motor, with an adapter plate already attached. 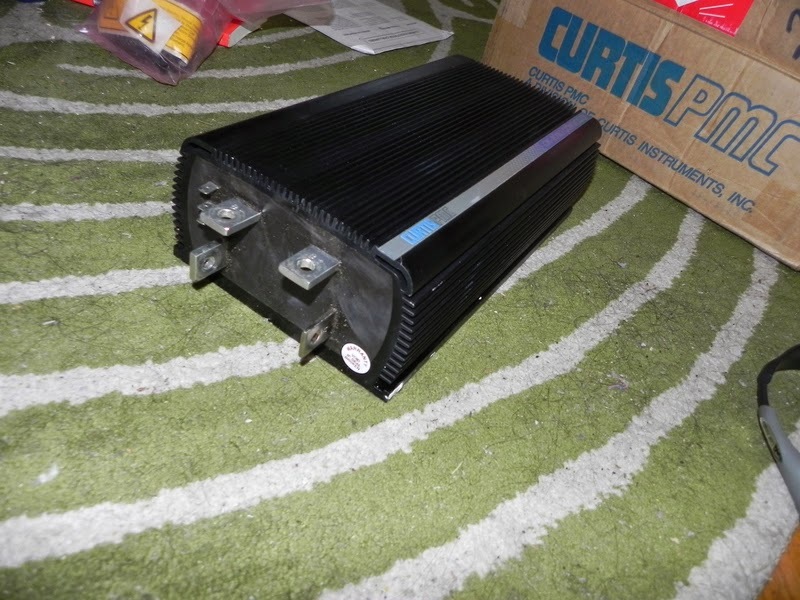 The motor came to me at a good price along with this Curtis controller. I eventually decided to not use this controller. 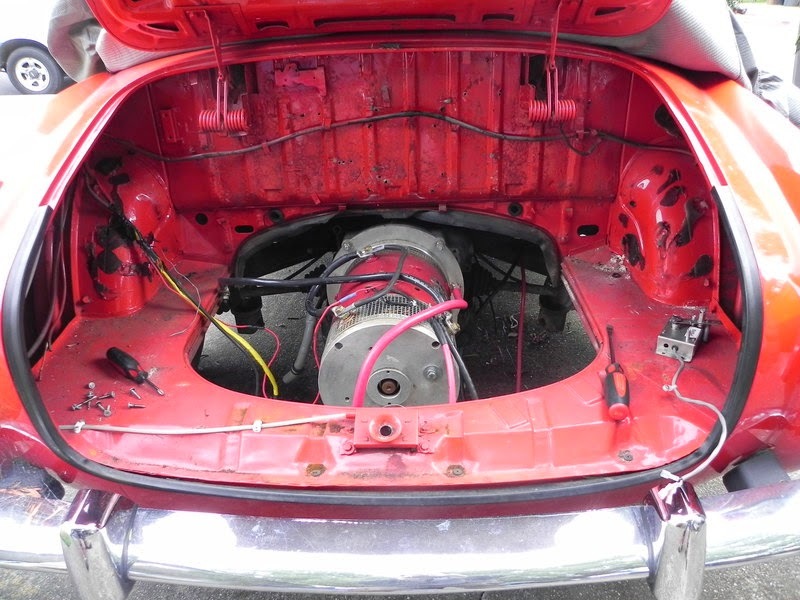 The engine compartment, with the new motor installed, and everything stripped out. The lead acid pack had been mounted on steel brackets, which would not be useful with the new pack so they had to go along with everything else. To swap the motors, I brought the car to a nearby car shop that did specialty work. That shop, Ellsworth Automotive in Mountain View, turned out to have been the shop in which Otmar Ebenhoech had gotten started in performing electric car conversions. The staff had plenty of stories about their time working together and the many VW’s they’d converted together. I literally picked that shop because it was near where I lived and the sign outside said they performed custom work - it was a huge bonus to work with people who’d already done a few conversions. All that said, the job I had them do was simple - swap the motor. I stripped out all the components myself, once the car was back home. There was an issue which arose later in the transmission. I’d been under the impression this car had an auto-stick transmission. There was no clutch pedal, and there was a stick shift on the floor. Thinking it had a VW Auto Stick, I just drove it without thinking too much about shifting technique. Eventually the transmission broke. That meant getting the transmission rebuilt, meaning taking it back to Ellsworth Automotive for help. That meant quite a bit of money for the transmission rebuild, and Ellsworth installed a hydraulic clutch pedal system. The front was similarly stripped out of nonessential stuff. The old DC-DC converter supported a 72 volt input voltage, but the new pack was to be 145 volts and that meant a different DC-DC. It’s an Iota power supply that happens to work as a DC-DC converter. Initially I wanted to reuse the cord reel for the charging system, but I eventually removed it. The black thing in the middle is the bottom half of the original gasoline tank. It had a little bit of bracket welded in, and the lead-acid batteries sat there. 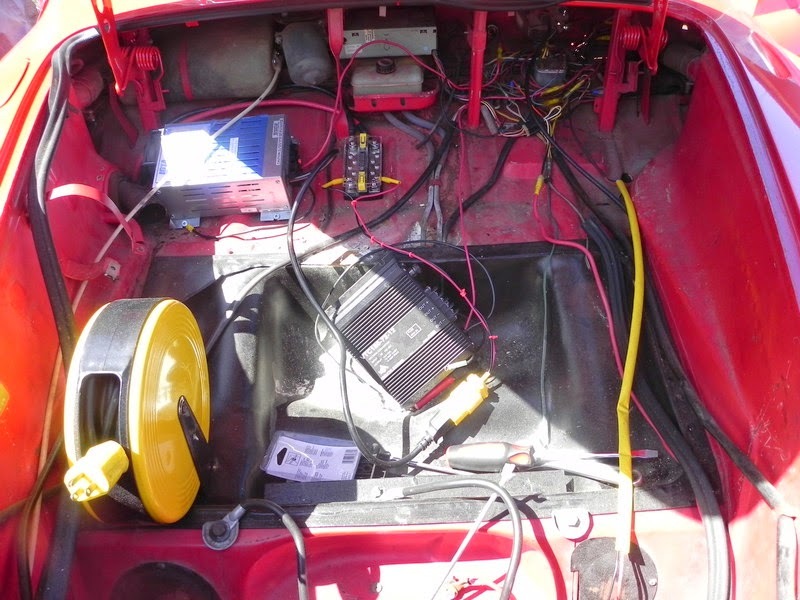 The car is wired with the negative side of the 12 volt system attached to the frame. In other words, frame ground. I don’t really like that idea, but that’s how it was when I got the car and it was easier to leave it that way than rewire it. This is how I measured the cabling required for the charging system. 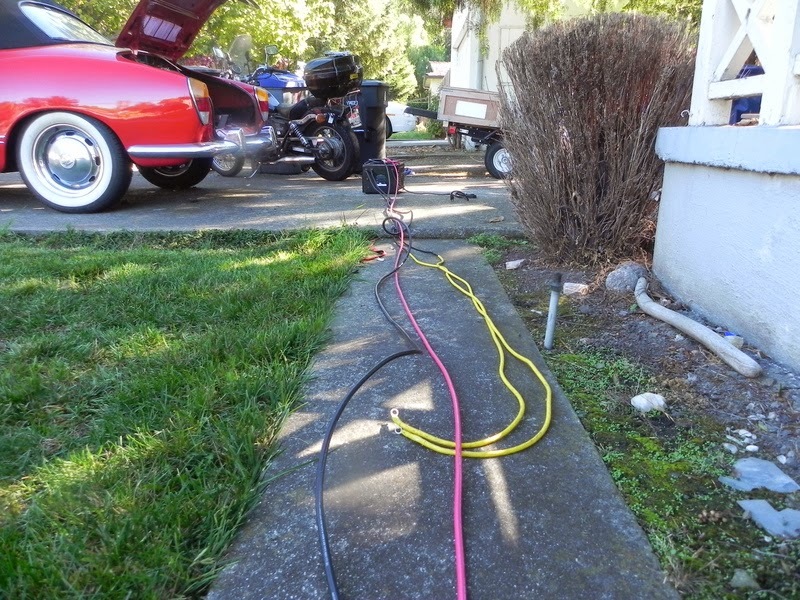 The original 72 volt lead-acid charger is shown at the other end of these cables. There were several cables running from front-to-back through a vent going to the engine compartment. The yellow cables are the original cables connecting charger to the battery pack, and they’d run through that vent. To make sure the new charging cables were the right length, I pulled the charger out, stretched out the cords, then cut the new cords to the same length. To protect the finish, and because I wasn’t able to park the car in the garage (too many other vehicles in the garage), I kept it parked in the driveway with this fine grey cover. That meant not having to worry when it rained, or when it was cold, or any other time, because the cover protected it from the elements.